On Sunday I went to the Museum of Cycladic Art in Athens. Sometimes I feel as though I’ve had my fill of ancient artefacts. Do I really need to see another broken arrowhead or shard of pottery? Figurines are a different matter, though. There’s something about sculptured images of the human form that cuts through the ages. And this museum has some great examples. It has plenty of Cycladic figures of the ‘canonical’ type. The arms are commonly folded in the same pattern and only the nose is shown in relief. The example below dates from 2800-2300 BC. Better still, for me, are the Cypriot ‘plank’ figures. Although of a later time period than the Cycladic figures (the example below dates from 2000-1800 BC), they are also more basic. The head and body are blocked out and the only thing shown in any detail is the arms. This simplicity doesn’t make these figures seem ancient. If anything, they are utterly modern. They remind me of Mark Rothko’s great late works, and help to prove that there’s nothing ‘abstract’ about paintings such as No. 12 (Black on Dark Sienna on Purple) (1960). 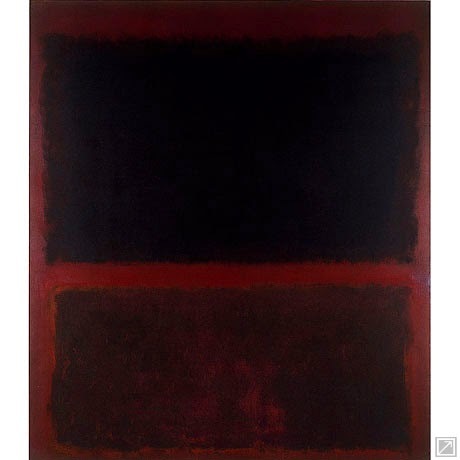 Instead, as Rothko claimed, his pictures are ‘expressing basic human emotions – tragedy, ecstasy, doom, and so on’. After the gallery I went to a bar with some friends. In the bar they were playing a compilation of 1950’s Chicago blues tracks. Howlin’ Wolf’s ‘Smokestack Lightning’ came on. It stopped me in my tracks. Is there a more powerful voice in the history of recorded sound than that of the Howlin’ Wolf? And is there any other singer who has been able to communicate more of his body through his voice? The chorus of 'Smokestack Lightning' hit me with the same force that the plank figures did. And it hit me in the way that I feel when I look at a Rothko. I was confronting humanity head on. For me, there’s nothing postmodern about linking Cycladic art to the Chicago Blues. I also fail to see anything ‘primitive’ or 'naive' in any of this art. Instead, the feeling that I get from 'Somestack Lightning' and from Rothko and from the figurines has more to do with what Greil Marcus once wrote about ‘Holidays in the Sun’: ‘no one has yet seen all the way to the bottom of [it], and probably no one ever will’. But these depths keep on drawing you in and you keep on staring.